Fruit of the quince selection Pigwa S-2 from Skierniewice, Poland, growing at the USDA-ARS National Clonal Germplasm Repository in Corvallis, Oregon. This variety was developed as a dwarfing rootstock for pears and may be more cold hardy than other quince rootstocks. 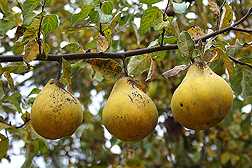 As the bright yellow, fuzzy cousins of pears and apples, quinces maintain a relatively low profile among the pome fruits. Traditionally, only a handful of quince cultivars have been grown in the United States, but their ranks are swelling thanks to ARS researchers at the National Clonal Germplasm Repository (NCGR) in Corvallis, Oregon. Over the past decade, NCGR scientists have expanded a modest quince collection into one of the world’s finest. The repository contains one of the most complete collections in terms of genetic and geographic representation, according to Joseph Postman, plant pathologist and curator of the NCGR pome fruit collection. NCGR scientists are examining the characteristics and genetic makeup of this collection for desirable agricultural traits. In Colonial times, many American orchards boasted at least one quince tree, and vendors sold the fruit in autumn with apples and pears. Today, quinces are much less common. Quince fruits are hard and sour when raw. When heated, their flesh turns rosy, soft, and sweet, but the challenge of preparing them decreases their marketability. They are also difficult to grow, as they are highly susceptible to diseases such as fire blight. Though you may not see many quince trees stretching their limbs toward the sky—fewer than 200 acres of quince are commercially grown in the United States—they still play an important agricultural role below the soil. 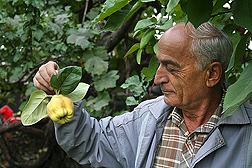 Before sharing cuttings with USDA plant explorers visiting his orchard, Dr. Vagharshak Hayrapetyan, of the Scientific Center for Viticulture, Fruit Growing, and Winemaking, in Yerevan, Armenia, explains that the Chartar Gyugh quince variety ripens late and can be stored almost until spring. “Quince is one of the only reliable dwarfing rootstocks available for pears,” Postman says. Dwarfing is a desirable trait for pear producers because it reduces maintenance and harvesting difficulties. In addition, dwarf and semidwarf trees produce fruit earlier than larger trees. Though some pear cultivars, such as Bosc and Bartlett, are less compatible with quince, its importance as a dwarfing pear rootstock is unchallenged. NCGR scientists hope the genetic diversity within their collection will reveal some traits that will benefit not only quinces, but pears as well. Only a handful of quince cultivars are commercially available from mail-order nurseries, Postman says. But recent foreign acquisitions have expanded the number of named cultivars in NCGR’s germplasm. The collection currently includes over 100 clones, including 41 edible varieties, 22 rootstock varieties, and two extremely rare quince-pear hybrids. The others are mostly wild or seedling trees from central and western Asia, the quince tree’s likely region of origin. The quinces in the NCGR collection are mainly European quinces (Cydonia oblonga), rather than Asian (Chaenomeles), which is grown more for ornamentation than for its fruit. Several varieties came from Turkey, one of the world’s principal quince producers. Some are rumored to bear fruit that can be eaten out of hand, without cooking. And the Turkish cultivar Havran produces much larger fruit than the other trees. Larger or sweeter fruits could expand the market for quince, Postman says, but the researchers hope the genetic diversity of the collection will reveal other positive traits. They are anxiously waiting to observe the characteristics of the other trees—from Russia, Uzbekistan, Ukraine, Iran, Armenia, and Georgia—hoping to observe indications of disease resistance and cold-hardiness. Quince’s susceptibility to fire blight is one of the key reasons its prominence has dwindled in North America. Could these new accessions hold the key to greater resistance? In the past, Postman notes, researchers have observed variations in susceptibility to fungal leaf spot diseases in the quince collection. If they discover differences in fire blight susceptibility within these new cultivars, scientists could selectively breed the trees for greater resistance. The diversity of the NCGR quince collection increases the likelihood that researchers will discover genes that can be used to improve pome fruit production.—By Laura McGinnis, Agricultural Research Service Information Staff. Joseph D. Postman is at the USDA-ARS National Clonal Germplasm Repository, 33447 Peoria Rd., Corvallis, OR 97333; phone (541) 738-4420, fax (541) 738-4205. Assorted quince varieties from the germplasm collection at the USDA-ARS National Clonal Germplasm Repository in Corvallis, Oregon. From top down, Van Deman, Cooke’s Jumbo, Ekmek, and Quince A, a rootstock variety used for grafting pears. Is this the fruit that launched a thousand ships? Quinces have a mythical reputation for stirring up trouble. Arguing that the quince may have been cultivated before the apple, some scholars credit quince as the mythological “golden apple” that started an argument among the Greek goddesses that culminated in the Trojan War. A similar theory suggests the quince may have been the forbidden fruit of the Garden of Eden. Quince trees are lovely and aromatic, but North American cultivars tend to produce fruit that is hard, dry, and sour when raw. Fruit from cultivars grown in warmer climates can sometimes be eaten from the branch. Cooking improves their flavor, and quinces are often used in warm desserts and meat dishes. They are also high in pectin, a natural gelling agent that makes them ideal for use in jams, jellies, and preserves. 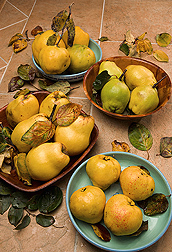 In addition to their trouble-making and culinary uses, quinces have many other functions. Throughout history, they’ve been used as perfumes, deodorants, and breath fresheners. Quince wine was hailed by some for its medicinal properties. And some varieties—mostly Asian quince—are used simply for ornamentation. Despite its versatility, the quince tree’s susceptibility to insect and disease threats has limited its cultivation in many areas, particularly those with cooler climates. While relatively common in Colonial American gardens, today quince trees are rare, and their fruit is considered a specialty crop.—By Laura McGinnis, Agricultural Research Service Information Staff. "Quest for Quince" was published in the January 2007 issue of Agricultural Research magazine.